Djupe, Paul A. and Ryan L. Claassen. 2018. The Evangelical Crackup? The Future of the Evangelical-Republican Coalition. Philadelphia: Temple University Press. Why did Donald Trump attract a record number of white evangelical voters without unified support—and despite nontrivial antipathy from evangelical leaders? The editors and leading scholars that contribute to the timely volume The Evangelical Crackup? answer this question and provide a comprehensive assessment of the status of evangelicals and the Christian Right in the Republican coalition. The expected “crackup” with the Republican Party never happened. Each chapter in this cogent volume includes analyses of the 2016 election to explain why—and why that is critical. 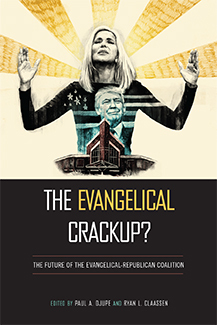 Chapters examine policy priorities, legal advocacy, and evangelical loyalty to the Republican Party; rhetoric, social networks, and evangelical elite influence; and the political implications of movements within evangelicalism, such as young evangelicals, Hispanics, and the Emergent Church movement. Djupe, Paul A., editor. 2015. Religion and Political Tolerance in America: Advances in the State of the Art. Philadelphia: Temple University Press. After a comprehensive review of work on the link between religion and political tolerance and the remaining gaps, a top notch set of contributors explores religion and tolerance among elites (for the first time among clergy too), the effect of clergy on members' political tolerance, new looks at religiosity and mass tolerance and its antecedents, new investigations of religious value effects, and then how religious groups respond to intolerance. The volume marks a number of entirely new ways to examine the religion-tolerance connection and should fuel research for a generation. Djupe, Paul A. and Brian R. Calfano. 2013. God Talk: Experimenting with the Religious Causes of Public Opinion. Philadelphia: Temple University Press. Religion’s influence on public opinion, politics, and candidates has been widely discussed in political science for a generation. 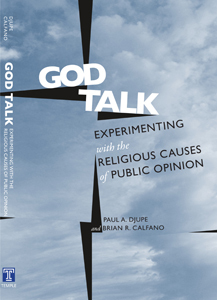 God Talk is the first volume that uses experimental methodology to establish whether and how that influence works. We provide an unprecedented look at how religious cues, values, and identity-driven appeals impact candidate selection, trust, interest group support, and U.S. public opinion about tolerance, the environment, foreign policy, and related issues. By situating our disparate, randomly assigned interventions within the broader framework of elite-based influence, we apply their new methodology to three questions: How do congregation-based elites affect congregation members? How are religious elites and groups and their public arguments evaluated? With what effect do political elites use religion? The results of the research provide a compelling framework for understanding the links between religion and politics. "This is one book that does not suffer from a lack of ambition. Paul A. Djupe and Brian R. Calfano set out to change not only the way that scholars think about religion’s influence on public opinion but also the methods that scholars use to investigate those relationships." David O'Connell, PSQ. "What distinguishes God Talk...is the care with which each experiment is designed and discussed, and the contextualizing of each within broader themes and ideas." Contemporary Sociology 43(6): 874. Djupe, Paul A. and Christopher P. Gilbert. 2009. The Political Influence of Churches. New York: Cambridge University Press. We investigate the political influence of church: how membership in organized religious bodies shapes the political life of members. Our goal in this inquiry is to re-center scholarly attention on the voluntary association as an essential element of American civic and political life. We develop a theoretical framework that captures the multifaceted elements of church life that affect individual political attitudes and actions. Political information from clergy, small groups, and social networks flows plentifully in churches, but individuals process that information differently depending on their motivations related to their status in the church. Articulating a more fully specified model of how associations expose individuals to political information and norms will help us understand the political opinions and behavior of citizens and the contribution of that pattern to sustaining democracy. "Djupe and Gilbert have written an important book on the impact of religion on the politics of individual church members. Rather than viewing religion from afar - as another characteristic held by individuals or another organization to which some individuals belong - they look at it from the inside. They consider the structure of life in churches, and the networks of relationships that connect church members to each other and to the world outside the church. This produces a very sophisticated treatment of the contingent circumstances under which churches make a difference in the politics of church members. By giving primary attention to the patterns of social interaction and communication within churches, the authors produce a masterful analysis that is reminiscent of the classical treatment given to labor union politics by Lipset, Trow, and Coleman in Union Democracy. Political science needs more studies like this one." "The Political Influence of Churches will be a genuinely seminal book. Djupe and Gilbert combine sophisticated theoretical understandings of religion and of group dynamics with an ambitious research design and resourceful data analysis. The authors' emphasis on the complex social interactions which take place within congregations will change the way in which we think about political learning in religious settings, and will affect future research in religion and politics for years to come." "Paul A. Djupe and Christopher P. Gilbert have written a forceful book that uses state of the art data to show that churches are about more than religion when it comes to politics. They are complex social organisms that support a wide variety of political behaviors, all of which are key to understanding how these people become citizens." "This book offers path-breaking analysis of how being active in religious life affects Americans' political orientations. Active participation in a religious congregation is perhaps the most widespread form of voluntary association in American society today, and Djupe and Gilbert elucidate exactly how such social networking shapes the way we obtain and use political information. This book is sure to be a seminal work in the literature on religion and politics." "Paul Djupe and Christopher P. Gilbert have published a series of intriguing papers on the politics of mainline Protestant churches. With this book they show us the full scope of this project, and the result is a volume that political scientists, sociologists, and anyone else who is interested in the political influence of churches needs to read." Djupe, Paul A. and Laura R. Olson, editors. 2007. 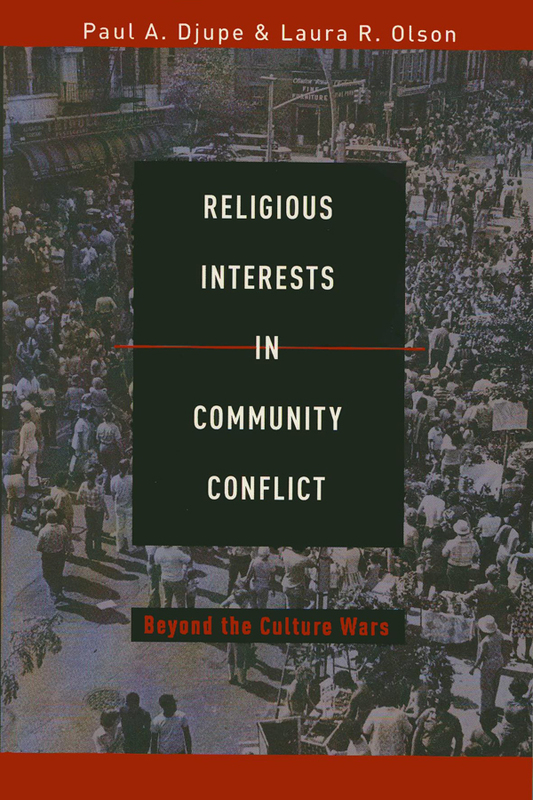 Religious Interests in Community Conflict: Beyond the Culture Wars. Waco: Baylor University Press. Djupe, Paul A. and Christopher P. Gilbert. 2003. The Prophetic Pulpit: Clergy, Churches, and Communities in American Politics. Lanham, MD: Rowman & Littlefield. Despite decades of claims to the contrary, the United States remains a deeply religious nation and American religious professionals occupy a prominent role in shaping the interests and attitudes of their congregations. In this timely and groundbreaking work, we analyze national data from a survey of over 2,400 Episcopal and Evangelical Lutheran Church of America clergy, looking deeper into their motivations for political action. Using the survey data, we argue that while personal motivations are a factor, the decisions clergy make about their role in political and civic life are greatly affected by the specific needs of their congregations and communities as well as ongoing influences from their denominations. As we head into another election season, The Prophetic Pulpit highlights the importance of every player in the political arena. "This is a very perceptive book--especially its attention to the dynamic interplay between clergy, their congregations, and the broader community. The authors write clearly and support their arguments with an unprecedented array of data and evidence. The Prophetic Pulpit focuses on clergy politics, but also illumines the broader issues of religion and American politics." "This is an outstanding book, full of important and path-breaking findings about the full range of factors that drive clergy's decisions about taking political action. 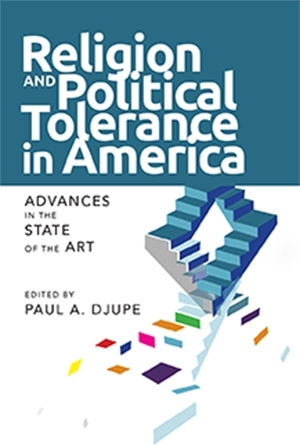 Djupe and Gilbert show that the external contexts in which clergy live and work have profound ramifications for their attitudes about political engagement." "Djupe and Gilbert are to be commended for a path-breaking study that challenges numerous stereotypes of mainline clergy activism and that paves the way for more sophisticated scholarship in the field." "In this fine book, Djupe and Gilbert provide an exemplar for future studies of clerical politics in the United States. This nuanced, methodologically sophisticated study will give pause to those who are too quick to relegate the Protestant Mainline to the political sideline." Gilbert, Christopher P., David A.M. Peterson, Timothy R. Johnson, and Paul A. Djupe. 1999. 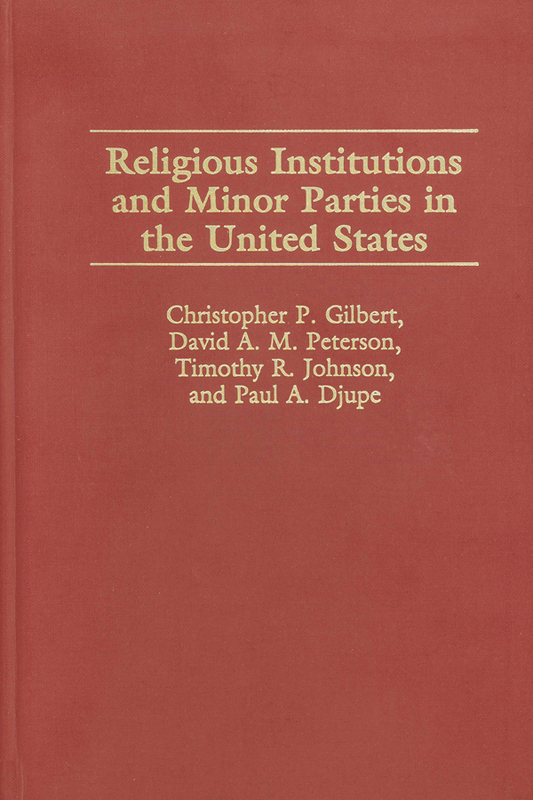 Religious Institutions and Minor Parties in the United States. Westport, CT: Praeger. We examine the impact of churches and church membership patterns on third parties and independent candidates in 20th-century U.S. politics. Candidates who choose not to run for office under the rubric of a major party face a well-known set of obstacles, yet the absence of discussion about the interconnections between religious institutions and minor parties is striking. The book presents a theoretical framework for understanding how religious institutions create, support, and sustain the political culture of local communities; by playing this role religious institutions support major parties and impede the electoral chances of political outsiders. The book's central finding is that third candidates are not privy to the ties that bind Democratic and Republican voters to their parties; one of the factors that creates and strengthens such ties is religion. Therefore, third candidates do best where church and party loyalties are weakest, or where third candidates have existing bases of support. The rare third candidate or minor party that possesses a base of support centered around a denomination or religious group can overcome such barriers. These conclusions are supported by analysis of census data, election returns, and voter surveys spanning the 20th century. Special attention is given to the 1992 and 1996 presidential candidacies of H. Ross Perot. This is an important analysis for scholars and other researchers dealing with American third parties and independent candidates and the impact of religion on politics. Djupe, Paul A. and Laura R. Olson, editors. 2002/2008. 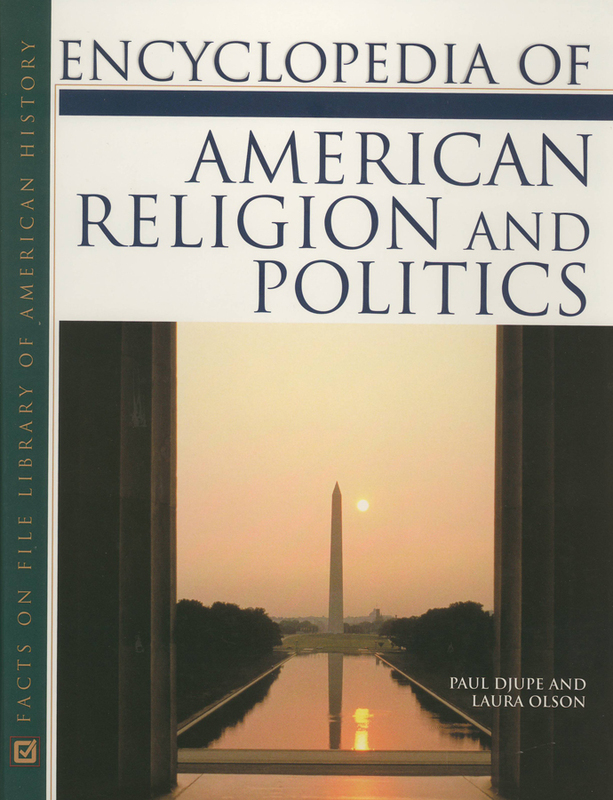 The Encyclopedia of American Religion and Politics. New York: Facts-on-File. This encyclopedia brings together "in one place 'the facts' about the people, groups, jurisprudence, forces, and phenomena that together tell the story of the interaction between religion and politics in America." A team of 135 scholars wrote the more than 600 entries, which focus on several themes, among them the roles played by religious organizations and beliefs in shaping American politics; religion and the Constitution; and the intersections between religion, political theory, and public policy.